TECHIMPs PDPortable AQUILATM has been expressly designed to respond to all requests for a robust and compact portable all-in-one PD detection station providing a full range of options ideal for on field applications. 20+ years of service experience has been condensed in this unit representing a state-of-the-art PD device integrating TECHIMP's innovative PD detection technology (T/F Map) with multiple connectivity (Wi-Fi, Fiber Optics, USB, bluetooth) and power supply. The instrument can be used to set-up a temporary monitoring system for simultaneous testing of HV cable during commissioning. Connection via fiber optic allows creating a network of acquisition units at different measurement points. 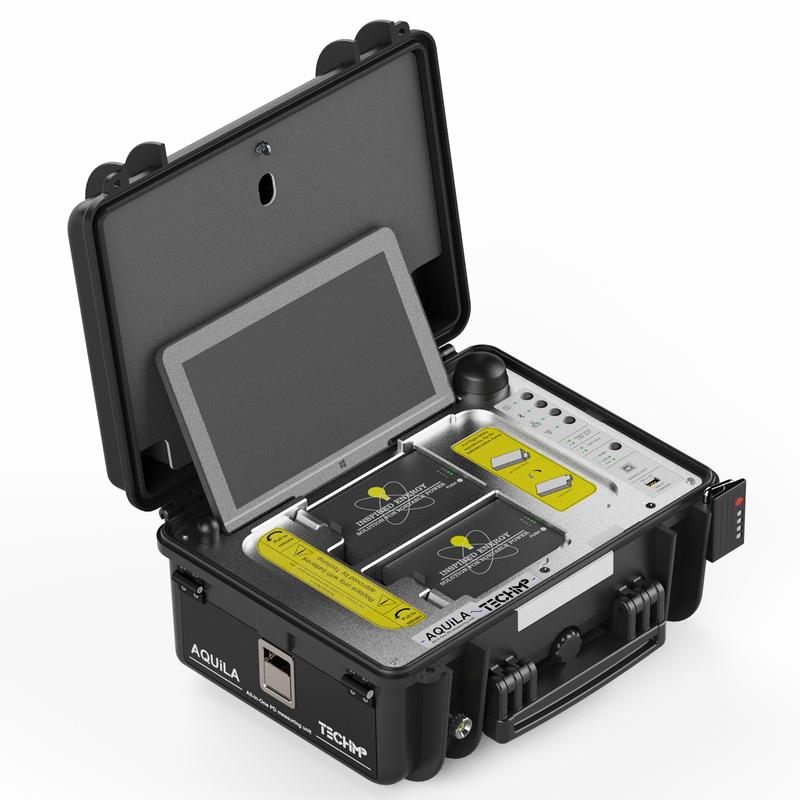 Techimp AQUILA has been expressly designed to be a robust and compact portable all-in-one PD detection station providing a full range of options ideal for on field applications. It can cope with the toughest outdoor conditions while taking measurements on any electrical asset. 15 years of service experience has been condensed in this unit integrating TECHIMP innovative PD detection technology with multiple connectivity (Wi-Fi, Fiber Optics, USB, Bluetooth) and power supply. The battery-powered unit allows testing activities for up to 20 hours without auxiliary power available. The setup of the unit is simple and fast allowing for taking measurements within minutes. The most outstanding feature is that it can be used for testing of MV and HV cables, power and distribution transformers, motors and generators, GIS and MV switchgears together with the right combination of sensors and filters. AQUILA can be used to measure on-line and off-line any electrical asset at any level of voltage and for any voltage waveform. It can be also used to install a permanent monitoring system, maintaining the needed degree of safety. Connection via fiber optic allows a network of acquisition units to be checked in different measurement points.